Seaview is checking a missile defense drone, part of a system Nelson helped create, when it activates, runs wild and launches a missile at New York. Seaview launches counter missiles and knocks the nuke off course but it destroys a million acres of forest and kills three rangers. Soon, more of the drones are headed toward the US coast in prep for firing. Nelson calls on friend and co-designer of the system, Rear Admiral Halder (Soviet? ), to help solve the problem of the rogue drones, not realizing he's inviting aboard the very man behind the plot. To determine who's behind all of this, Nelson decides to go after a drone and board it, that he might obtain additional data. Drone goes rogue early in the episode. Admiral Halder and Verna exchange knowing glance. Halder heads back to his base but leaves his assistant (Verna) aboard Seaview as his liaison. Verna, of course, is the one who's helping activate and control certain of the drones with the scrambled messages she's sending out via the radio shack. 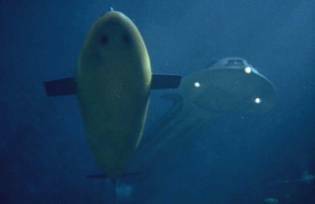 After dangerous maneuvers over the closest drone, which is held in check by a Seaview created force-field, Nelson obtains the Telltale he needs and heads to Halder's undersea headquarters to speed analysis of the thing. On Nelson's arrival, Halder announces his intention to blow up several east coast US cities to blackmail his country into making him its leader. Eventually, Sparks can't contain his suspicion and goes to Crane complaining of the curious timing of Verna's messages to troubles they've had with the drones. It's enough to tip the suspicious Crane's thinking, and he accompanies Verna to Halder's lab, in spite of the fact that Halder claims Nelson has already left in the Flying Sub. Crane is imprisoned along with Nelson and the two escape using tools that Crane has snuck aboard hidden in his jacket. 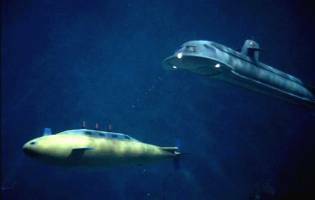 They knock out the crew of the undersea base and reset one of the drones to destroy it. They then hightail it back to Seaview just before Halder's base goes up in a big bang, releasing the rogue drones from his control. 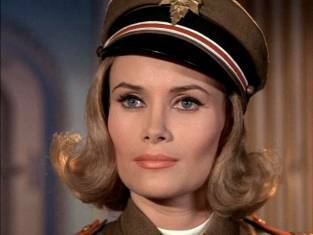 Francoise Ruggieri as Capt. Verna Trober. Outrageously good miniature effects grace season 2 of Voyage. The budget must have been hammered the following year. 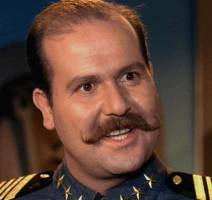 Mark Says: A very entertaining episode, with the usually campy Roger C. Carmel reeling himself in with a good performance. 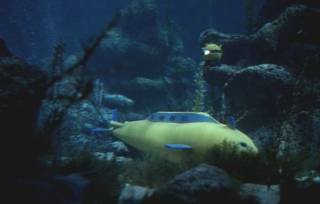 The special effects budget goes into over-drive with many interesting shots of Seaview pursing a deadly, yellow submarine. One curious blooper - in Act I, Senator Kimberly angrily screams at Nelson about a forest fire. In a later scene, Nelson calls Kimberly to update him on things and it�s a much friendlier call - but listen closely to the barely audible voice of Kimberly over the phone - it�s simply the same ranting diatribe about "forest fire" played over again. Mike Says: This story is driven by it's special effects, which are, for the most part, outrageously good, and integrated in such a way that they augment the story rather than just being the story. That's a very good thing. Actually allowing a nuke to land in upstate New York and flatten acres of forest was not the kind of thing Voyage often did. It sets the stakes for the episode right out of the gate. 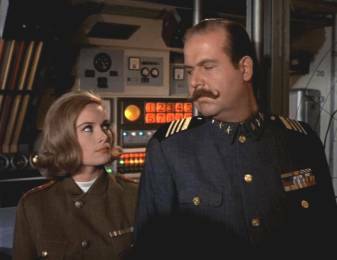 My own personal feeling is that this episode would have been even more effective if Halder had been played by someone other than Roger C. Carmel. Yes he was more restrained than usual, but that smile still oozed smarmy excess. One of Season-Two's more enjoyable actioners.